There will be some characters in this space added later, but first I'll be working on the bottom portion of the print. I hope to get a little more done tomorrow before I head out to Seattle on Wednesday. 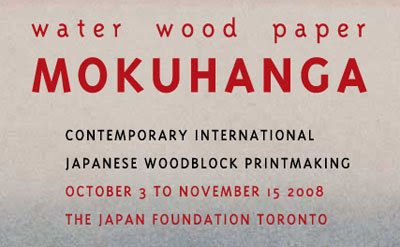 One of the readers of this blog let me know about a show opening in Toronto this coming weekend that looks fantastic, called "Water, Wood, Paper: Moku Hanga". The show runs from October 3 to November 15 and takes place at Toronto's Japan Foundation. Participating artists include Akira Kurosaki, Kyoko Sakamoto and Ralph Kiggell among others. If you can't get to Toronto to see the show (as I can't), the web site itself is wonderful, showing lots of work samples plus some very interesting tips and techniques. Enjoy! Still working on these 0s and 1s. So last weekend I had a few friends over, including an artist friend (sculptor) named Anna. I was showing them how moku hanga works, demonstrating with one of the blocks from my Mecca print. Anna got it right away, of course. She asked a few questions, was quiet for a moment, and then she said, "That's crazy. That's insane. Why don't you just do it on the computer?" It is crazy. I guess that's why I'm doing it. I love the fact that I'm not doing it on the computer. I love the fact that it takes a gajillion hours to make these 0s and 1s. It's uneconomical, it's crazy, it's positively counter-cultural. I feel like a quiet revolutionary. I'm sorry, I may have misled you with that last photo. Here's a shot of the whole board. Sorry for the terrible lighting -- I took the picture at night. I'm planning for these zeros and ones to look like snow when I print them. I didn't count them, but I'm sure there are over a thousand digits here. The carving is going fairly quickly, though. Quicker than I thought, at least. The fact that internet access in China is filtered and censored to weed out material that the government deems unacceptable has been well documented. This censorship is often called "The Great Firewall of China" and I wanted to reference this in my Great Wall print. This means I have a lot of 0s and 1s to carve. It's estimated that some 30,000 Chinese civil servants are employed to monitor Internet traffic and block content that is deemed undesirable. There are also freelance censors and volunteers who report violations to the authorities. All this scrutiny creates the perception that users are always being watched, which in turn sets up an environment where individuals and businesses willingly self-censor to avoid repercussions. Ooops, I think I just triggered the system! I've been reading this book by Harm de Blij for the past week and have found it surprisingly riveting. Granted, I'm a map fiend and am predisposed to being interested in geography. Nevertheless, the breadth and relevance of this book surprised me. De Blij shows again and again how an examination of geography can add immeasurably to our ability to comprehend complex global issues. 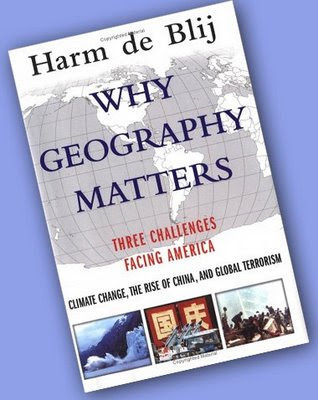 He examines a unifying Europe, rising China, chaotic Russia, troubled Africa, global climate change, and the threat of terrorism, and reveals surprising connections between all of these matters, showing how and why geographic literacy is critical to America's national security. Another book by de Blij is waiting on my reading table, The Power of Place. As I mentioned a few posts ago, I've had an influx of illustration work that's slowed down my printmaking to a crawl. Good for the pocketbook, though. I have managed to finish carving one plate for the Great Wall print, shown above. Recently I've been doing a lot of reduction blocks. When using that method I carve, then print, then carve again. In this case, though, I'll only be doing portions of reduction printing, probably mostly in the bottom section of the print, so I have another block to carve for the upper area before I do any printing. The New York Times has an online slide show about an exhibit at the Asia Society called "Art and China's Revolution" that has some great graphics from the 1949-1979 Cultural Revolution. An accompanying article describes some of the difficulties encountered in mounting the show, including a last-minute refusal by the Chinese government to supply some promised works. The show is a great reminder that images are incredibly powerful. China is not the first or the last society to harness that power to try to manipulate the thinking of its people.